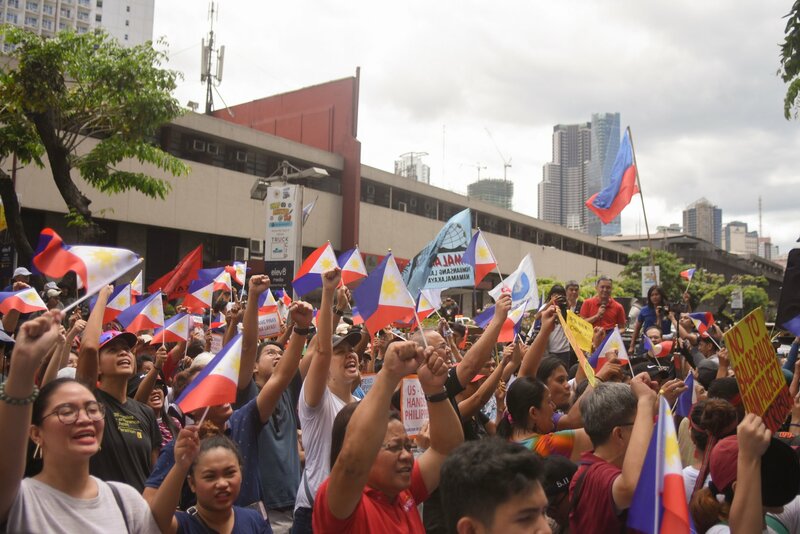 MANILA – As the country commemorated Araw ng Kagitingan (Day of Valor) today, April 9, hundreds protested in front of the Chinese Consulate in Makati City against China’s continuing invasion of the West Philippine Sea and other parts of the Philippine waters. 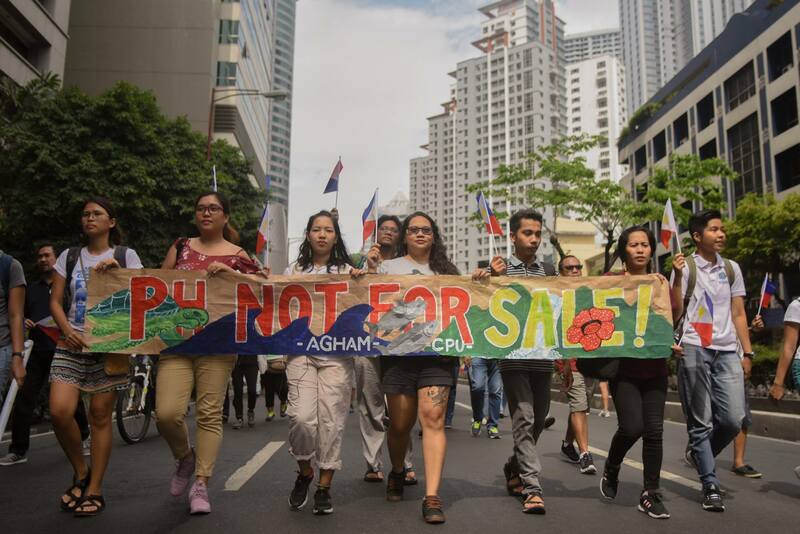 Led by the broad patriotic alliance, Pilipinong Nagkakaisa para sa Soberanya (P1NAS), they also condemned President Duterte for his weak stand against China’s incursion and for favoring loans which they described as disadvantageous to the welfare of the Filipino people. “Today, we recall the sacrifices and heroism of Filipinos who fought foreign invaders in the Fall of Bataan. We reaffirm the need to defend Philippine sovereignty, sovereign rights and territorial integrity against any and all foreign occupation and intervention,” the group said in a statement. 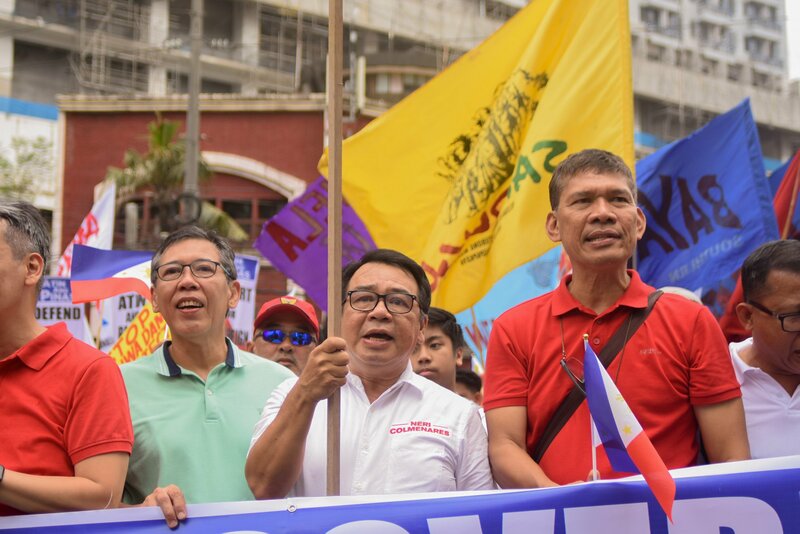 Senatorial candidates Neri Colmenares, Jose Manuel “Chel” Diokno, Leody De Guzman and Sonny Matula joined the protest. Colmenares slammed Duterte’s subservience to China. “During the campaign period (2016 elections), Duterte said he would assert our rights in the West Philippine Sea but when he was elected as President, everything changed. His foreign policy became a kowtowing policy,” Colmenares said. 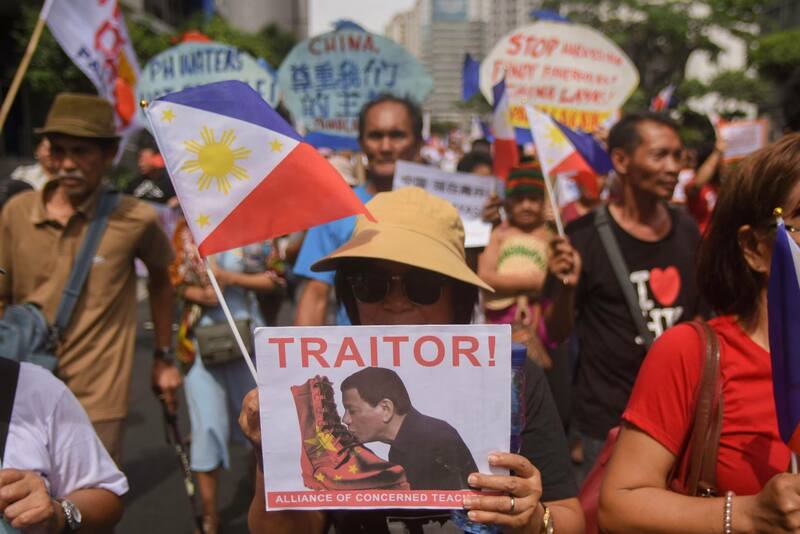 Colmenares said Duterte’s claim that China would attack the Philippines once he fights for the country’s sovereign rights in the Philippine waters is a sham as the international community, especially the neighboring countries, would certainly protest against China’s aggression. He said that as president of the Philippines, Duterte could always fight for the country’s sovereignty especially because the Permanent Court of Arbitration invalidated China’s claim in the West Philippine Sea. However, the president chooses not to, Colmenares said. “What the Philippines needs is a patriotic leader, not a macho leader but weakling in defending the West Philippine Sea,” he added. Diokno also urge other Filipinos to stand up for the Philippines sovereign rights in West Philippine Sea. “It is about time, we should let Duterte and China know that this is ours. 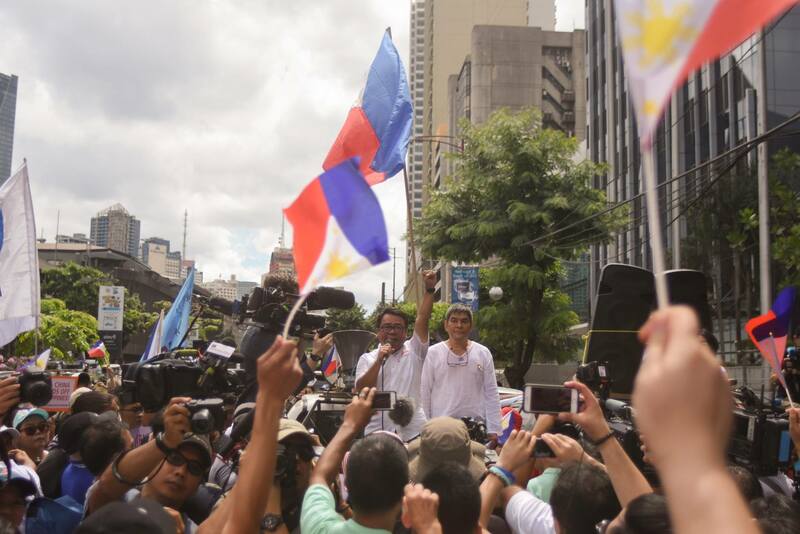 The Philippines is for the Filipinos and we will stand up for our country until the end,” he said. Dumagat leader Wilma Quierrez meanwhile lambasted the onerous loan of the Philippines government to China. She said this loan which was supposed to fund the New Centennial or Kaliwa or Kanan dams would only wipe out their ancestral lands in Sierra Madre. “This will ruin the livelihood of the Dumagat tribe and the peasant farmers and fisherfolk in the provinces of Quezon and Rizal,” she said. 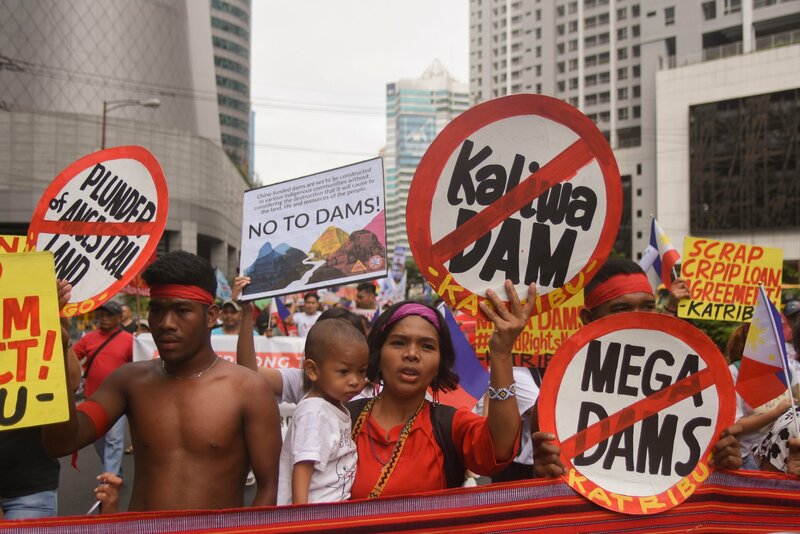 She said the Dumagat and other indigenous people who will be affected by the dam projects will not get tired of coming back to the country’s capital to protest. “That is why I brought with me today my two children so that they will continue our fight,” she said. Renato Reyes Jr., secretary general of Bagong Alyansang Makabayan (Bayan), said that they aspire for the country to be independent and not to be reliant on imperialist countries’ weapons, military base and deceitful economic aid. “What we want is a genuine independent foreign policy that prioritizes our interest as Filipinos,” Reyes said. 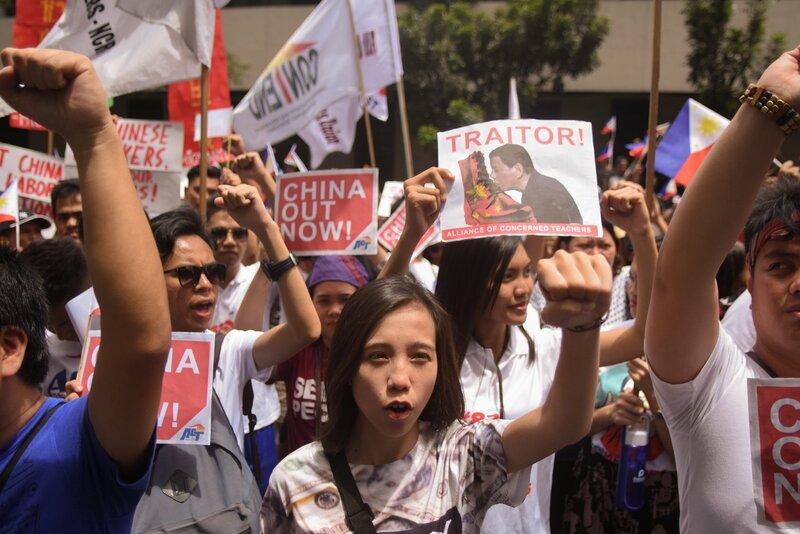 The program in Chinese Consulate ended with the protesters waving the Philippine flag in front of The World Center building. “We know it’s holiday, but there are people of the Chinese Consulate who are watching us down here. Let us wave our flags and say in full force, ‘Atin ang Pinas! China layas!” (The Philippines is ours! China, get out! ) Reyes said. Prior to World War 1, avowed nationalists from European countries mindlessly prodded their citizens to defend their nations’ rights and honor. Russia’s Vladimir Lenin, Germany’s Rosa Luxemburg saw through the irrationality of these bourgeois ideologues and did everything to prevent the impending war, since they rightfully knew that the elites don’t fight the wars, but the working people of these countries will fight the bloody wars. They failed to prevent the war, and carnage and mayhem followed. The South China Sea issue has been framed in much misinformation. Unfortunately, Mr. Colmenares and the Makabayan nationalists have not educated Filipinos properly about the intricacies of this issue. I agree with many of Mr. Colmenares’ ideas, but I am very disappointed about his party’s approach to the SCS.